Heavy metal screamo fans will be screaming with joy at the Vans Warped Tour this weekend. It’s like Countryfest for country music fans — just swap out the cowboy boots for a pair of metal studded Converses. Trade the cut-off jean shorts for some tight half-off jeans. And exchange the uplifting honky-tonk tunes for what punk fans have deemed ‘emo’ (not so uplifting) beats. Oh yah, tattooed covered bodies and ear piercings the size of tennis balls are welcome, too. 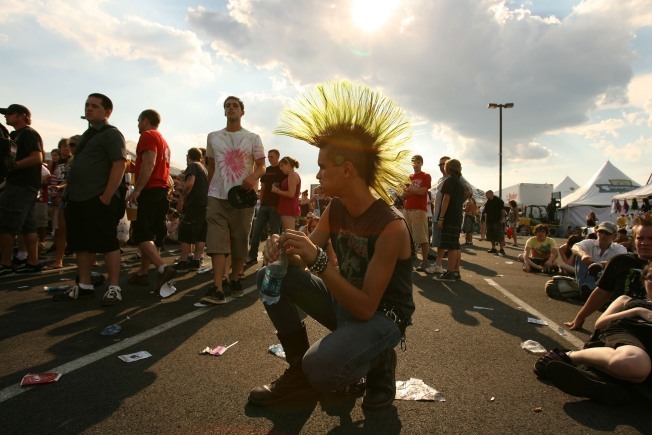 The summer’s legendary Warped Tour will return to the Comcast Theatre this Sunday, July 12 and has punkers, well, punking. Skateboarding shoe manufacturer Vans is the primary sponsor of the spectacle, which precisely embodies the persona of the modern teenage counterculture -- one that seems to be growing in popularity. The annual punk-rock showcase celebrates the big ‘one-five’ this year and has been the heart of punk rock music, ultimately luring the phenomenon into the spotlight of mainstream America. This Sunday, that spotlight will be on veteran bands such as Less Than Jake, NOFX and Flogging Molly. Another change Warped Tour connoisseurs will notice is that this year's tour will feature only one main stage with bands playing 40 minutes each, instead of two main stages with 30-minute sets like previous years. Tickets are $40 for the full day and can be purchased at livenation.com. For a full list of bands visit the Warped Tour website. So bring on the mosh pits, all our punk peeps! But please, beware of the spiked belt buckles.